The best Faculty of Law is the first choice of prospective students who are interested in law. One measure of quality and quality of a Law Faculty (Law Studies Program) can be seen from the accreditation. 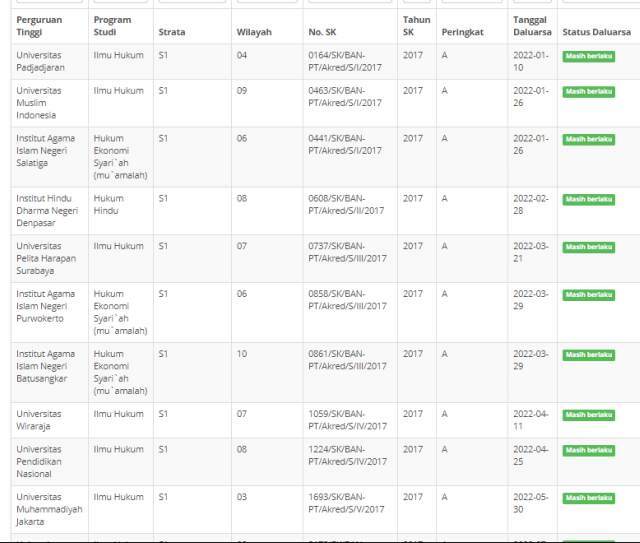 Based on data of BAN-PT as of January 2018, from 493 Law Study Programs in Indonesia scattered in various Universities and Colleges, only 80 Law Study Programs with accreditation A. The rest 304 with accreditation B and 109 with accreditation C.
Observing the percentage of Law Studies Program whose accreditation A as of January 2018 is seen to increase in number, but not yet significant. This means that more efforts are needed to achieve the quality of legal education in Indonesia. This is at least reflected in the number of Law Study Programs accredited A more than the accredited B. Even accredited C should be only in a very small amount of persetage.